When the player is in third person mode (looking at itself), is wearing a helmet or/and the player's hat layer is activated, and is looking up/down in a certain angle (pitch/veritcal angle), a glitchy line which may be in the color of the helmet/hat layer will show up beneath the players head. 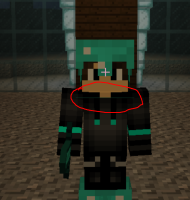 This happens with any type of helmet (leather, gold, iron, chain, diamond). Also, lines may show up in different lengths. IMPORTANT: The lines show up depending on the game-window size, the player's FOV and if there are blocks in front of the player (looking down in F5 mode with a block in front of the player will bring the camera closer to the player's head); on different FOV levels, different lines will show up on different angles. Also, this issue doesn't really follow a pattern. Sometimes a line shows up, sometimes it doesn't. This bug can be reproduced by putting on a helmet and moving the mouse cursor up and down for a while on different FOV levels. Sooner or later a glitchy line will show up.